Hi! 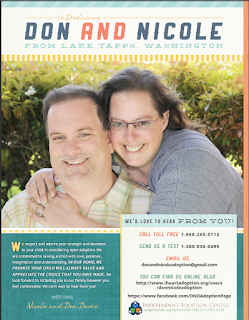 We're Don and Nicole from Washington state. We are approved and pursuing Open Adoption through Independent Adoption Center. If you or anyone you know is looking into adoption as an option, please share our journey. Want to know more about adoption; you can contact us anytime. Ok, It’s a normal everyday Monday and I had to run errands because, well lazy weekend. I got our 3 year LMHL letter in the mail today. YAY! Now to fill it out and send it in! Then our AC returned our call from late last Friday regarding some up-coming changes to the website I had some questions on. While she couldn’t answer them outright she did send for more info so I should know within a few days. Again I see this as a win. Oh, look a call from ?? from IAC ok why are they calling. Holy Moly someone is looking at us and uh YES! Oh but wait what I actually said is please find out more because we just had our lives shattered a few months ago and I don’t want to be considered if we won’t be a good match. Now you know 6 months ago I’d have immediately jumped yes, yes, yes call me! ; Today not so much. I am THRILLED we are being considered but I want to be sure it’s a good fit. This is the sad face of adoption. This is the reality that happens that most of us don’t talk about if we’re long waiters. I want this to work out and be the ONE but I’m also resigned to the fact she could choose another family or to parent. Adoption is amazing and beautiful if a painful, emotional route to a family but I still keep the faith it’ll happen for us one day. To me, on paper she is a perfect match for us but until we talk I won’t know. Here’s the one thing I do know, this potential match if it happens, no one will know. I cannot put my family and friends through what we went through previously. Only if it’s a success will anyone know. Sorry family and friends but it benefits us all in the end. Yes, I’m all for Open adoption but not the heartache that can happen from it not happening. (Believe me someone or two or three in my adoption circle will be hearing from me because um high emotions but I trust them to say nothing and let me vent). I’m hoping our check in tomorrow gives us good info to move forward. I hope we can connect and get a rapport going. So many emotions on all sides if you haven’t been here you don’t explicitly understand. I don't expect you to but please don't suppose because I posted this that we are matched; we aren't. It's simply a contact and most of those go with the wind, I hope not here but I always hope that way but the fact is until we match, get relinquishment, and then get home it isn't a done deal. Even then we have to go through extensive post-placement reviews by the state to be sure everything is going as it should. So it's a brutal few months even after the birth/placement (should it happen). I may sound harsh or cold but honestly I’m not. I’m protecting everyone’s’ hearts, including our own and the mother in question, it’s her child until she signs relinquishment's. I want nothing but the best for the child and their mother and I do hope it’s us but if it isn’t; it isn’t. I can’t help and won’t change who we are or what a mom may want for their baby. I want nothing more than to have a mother we really connect with who has a support network and open adoption in her heart. Let’s rally! Go team Davis! Share our website, IAC pages, Blog, FB, Instagram, Twitter and youtube pages (all linked here). It’s been awhile but we did go to Dragon Con. We had an absolute blast with our friends. We did discuss what happened in TN and then we moved on. It was the best medicine! We went to concerts, Balls, and a rave. We had our Best. Con. YET! We can’t wait until next year! Our tickets are bought and another of our friend’s from Seattle is also planning to go. We’ve asked her to go the last couple years but it hasn’t worked out so next year should be great as well. The unfortunate issue is Don picked up a cold and on our flight home it started to manifest. A couple days later I was down for the count. His was a head cold of a few days with a slight cough that cleared up within 5 days. I got the lung infection of Bronchitis that had me way under. When I first got sick I thought ok in a few days it’ll go as his has; that didn’t happen ( I haven't been sick like this in years - a couple days of sniffles but not down and out sick like this was!). I got the cold and it started on day one as a sore throat and a head cold and by day two it was in my lungs. I waited it out with over the counter meds and lots of sleep for a week but then it was clear it was more than a cold. I went to the clinic and the doctor was worried I might have a severe case of Phenomena. Luckily my X-rays showed it was just Bronchitis. A bunch of prescriptions later I was sent home. So for the next couple weeks I took my steroids, Antibiotics, inhaler, cough medicine, and cough syrup and I was beginning to feel better. So that was my September. I was fortunate to be better and was able to make my friend’s wedding. I was thrilled to be a part of her special day. Now it’s October and it’s a reminder that soon we’ll be a part of the National Last minute Hospital List for our agency. Honestly I thought we’d have the paperwork by now but I guess it’s a couple weeks out so there is still time for the letter to arrive. What is the last minute Hospital List? It simply means we’re on the list for all the areas our agency is involved in (meaning where they have offices). It’s really just a finite second chance because they really don’t have that many last minute placements but it is something better than nothing and a hope for a future of becoming parents. So I await that letter so we can be included in Last minute hospital situations. We are also not far off from the top 50 longest waiting families so again more hope of even more exposure in our wait. Until then I look forward to friends and family days (yesterday was a friend game day and it was 13 of us so I can't wait to see how it happens the next few months!) and look forward to the holidays this year. My brother and his family moved home in August so I can’t wait to spend it with them after 4 years away. I’ve really missed them and am looking forward to this year. Today they were supposed to come visit but something happened and they couldn't so hopefully soon they can come visit. We're an animal loving couple with 2 dogs and 2 cats hoping to adopt a newborn domestically in an open adoption through Independent Adoption Center. We are excitedly waiting for the opportunity to be parents so please share our journey if you know anyone who might be considering adoption. Welcome to Babyville: Population Us!